US carmakers have said told a House of Representatives subcommittee that the industry alone could not act on climate change. The heads of the big three – General Motors, Chrysler and Ford – said that measures to improve fuel efficiency were not enough and may cost thousands of jobs. 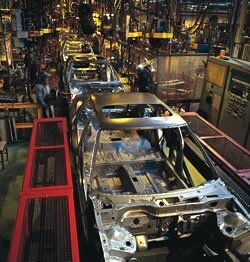 The car makers were joined by Toyota and the United Autos Workers (UAW) Union in the meeting with politicians at a time when global warming and ways of tackling it are high on the global agenda. Meeting a target to boost fuel efficiency by 4% would by “extraordinarily expensive” and “technologically challenging” said GM’s head Rick Wagoner. The UAW President Ron Gettelfinger said that raising fuel economy standards “could lead to calamitous results “including tens of thousand of automotive jobs”. President and chief executive of DaimlerChrysler’s Chrysler Group, Tom LaSorda called for more alternative fuels such as ethanol and bio diesel to be used. “We all need to be very clear on one point – new vehicle efficiency improvements alone will never result in the overall decline in petroleum consumption and greenhouse gas emissions we need,” LaSorda said.